• Hand-numbered limited edition of 1000. • Housed in old-style tip-on gatefold jacket. • Lovingly remastered from the original multi-track studio tapes. 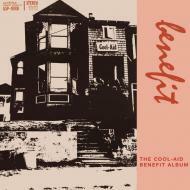 • Includes liner notes and original artwork from The Cool Aid House. • Obscure cuts available nowhere else, in a wide variety of styles: weird electronic sounds, heavy garage fuzz guitar freakouts, stoner rock, and acoustic folk.